Some people don’t like Science. They think it dehumanizes us, mechanizes us and devalues our spirit, our aesthetics and our passions. It is heading our planet in the direction of ecological disaster, devastating wars, nuclear catastrophes, urban decay and continued extinction of most species, if not life itself. It’s a “Blade Runner” type of view, a kind of techno-apocalypse, made very popular by most of our “Science” fiction, cinema and art. And then there are the “cornucopists” – a growing group of scientists and futurists who see a vision of plenty, sustainability, connectedness and unprecedented good health and prosperity through exponentially growing technology, outstripping our arithmetically growing challenges. The Singularity University (SU) in Mountain View was founded by a pair of such dizzyingly optimistic futurists: Ray Kurzweill and Peter Diamandis. I have had occasion to talk about Peter Diamandis’ book, Abundance: The Future is Better Than You Think in a previous blog and I strongly urge you to read it if you haven’t done so. 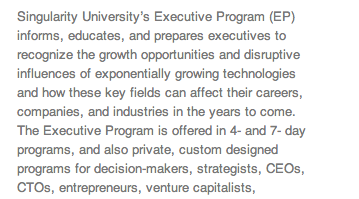 Last week at the invitation of my friend, Vivek Wadhwa, who is VP of Academics and Innovation at SU, I attended a seminar there, a part of their special Executive Program. As you can see from their website blurb on the right, this program is designed to acquaint key decision makers with the latest exponentially growing technologies. The technologies are presented at SU by scientists and entrepreneurs who are already developing tomorrow’s products and changing the landscape of possibilities for the U.S and the world. The seminar was on the future of Health and Medicine, and was conducted by Dr. Daniel Kraft, Chair of the Medical Track at SU, and a Stanford and Harvard trained physician, scientist, entrepreneur and innovator. 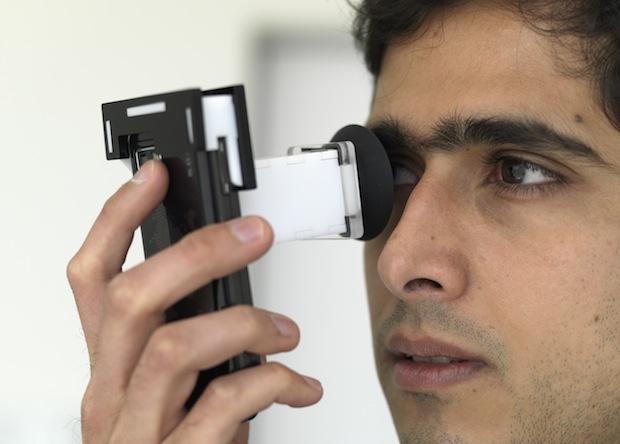 iPhone product by Netra for eye testing. mobile devices that can diagnose a patient better than a group of board certified doctors (I believe an X-prize of $10,000,000 is being offered for this goal). 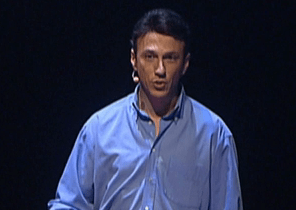 His vision is presented in this TED video. These ideas are not some future pipe dream – they are being developed and implemented right now. In five to ten years the landscape of healthcare and medicine will be completely changed to a new paradigm dubbed Healthcare 2.0. Skincare, ADHD testing, Ear and Hearing related, Renal Symptoms and many others. The results of these tests can be continuously generated and stored for real time, preventive or post disease monitoring. 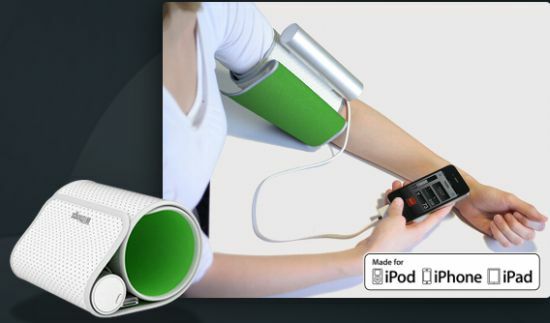 Portable X-ray machines the size of an iPhone ($1 per X-Ray) using luminescent scotch tape! Lab-on-a-Chip, such as Gene-RADAR, developed by Dr. Anita Goel, Nanobiosym, that can detect the RNA/DNA signature of any pathogen in your system, named and reported to a central computer. Virtually costless. 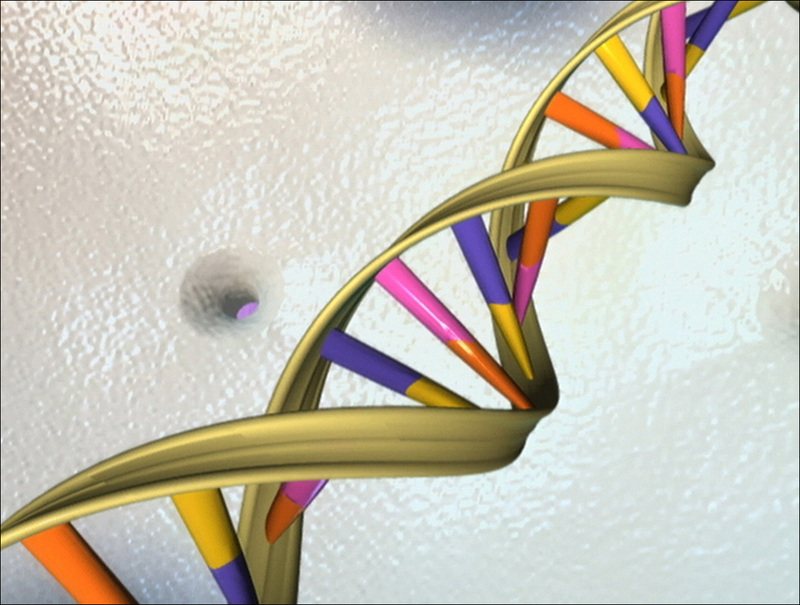 Genetic analysis and Genome mapping to facilitate personalized treatments. The cost (companies like 23andme) has come down to a mere $100 for a complete genome mapping soon to be under $1. Smart Toilets – stool and urine daily testing and data storage. Get your poo log (actual name of product) data analyzed. Detailed User’s Manual and treatment plans personalized for your body on the web. Routine surgeries via remote robotics. Already 80,000 cases per year! Stem cells – bone marrow mining and baskets of bio-manufactured human parts! You get the idea. It’s huge, what’s going on. We have the potential to use exponentially growing, convergent technologies to provide universal healthcare of unprecedented quality and individualization at very low cost. We can overcome a shortage of doctors and specialists and create a world where humans are connected with one another and contribute to the general wellness of billions! This entry was posted in Current Events, Healthcare, Innovation, Investing, Medicine, Money, Science. Bookmark the permalink. I have an advisory brochure from Johns Hopkins asking those seeking robotic prostate surgery to check if the doctor performing it has a commercial interest in his equipment. If he does, his motives for advocating the surgery may be suspect. Until we fix the complex ethical, social and economic dimensions of how medicine is dispensed, the deployment of “cool” and helpful technology will be likely skewed by established interests. Mohan says: I do believe in the power of technology to improve lives over the long term. But each new technology will increase cost at the start; then costs will come down over time just when newer technologies will come forth at higher costs.The nation has to have financial resources to nurture and be able to absorb the costs of these technologies. US better get its house in order. What an uplifting blog! In these days of exponentially rising health care costs, this provides hope for the future that this upward cost trend can not only be halted, but reversed! Thanks for sharing! I think this is outstanding and I absolutely agree that technology will help go a VERY LONG way in terms of helping with health care generally. I also think there is not sufficient emphasis given to preventive healthcare. 37% of the country right now is obese and that is the number one leading preventable cause of death. For those that are in the Bay Area, we may be in our health bubble given the cognizance that exist around health, nutrition, etc… That is not the case across the country and in fact, obesity has not abated over time, but actually gotten much worse. So I think the first question is how can we get the nearly half of Americans that fall into this category educated, aware and motivated to focus on diet/exercise/nutrition and overall health to reduce the likelihood of various diseases. And how can we do all of this with scale, sophistication and effectiveness with technology? 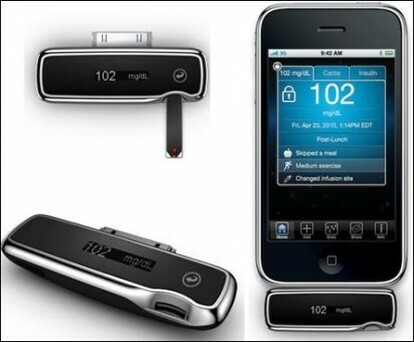 It is amazing to see how technological advancements can absolutely impact and change world health.